When my paternal grandfather immigrated from Stadsbygd, Norway in 1880, he took the train to the end of the line, which at the time was in western Minnesota. From there, he and a couple of comrades hiked several miles to Rothsay, Minnesota where they found jobs with local farmers. I'd never visited Rothsay until this afternoon when I spotted an exit for it on the Interstate between Fargo and Fergus Falls (I'd been in southeastern North Dakota at a family reunion replenishing my "Minndakota" accent). 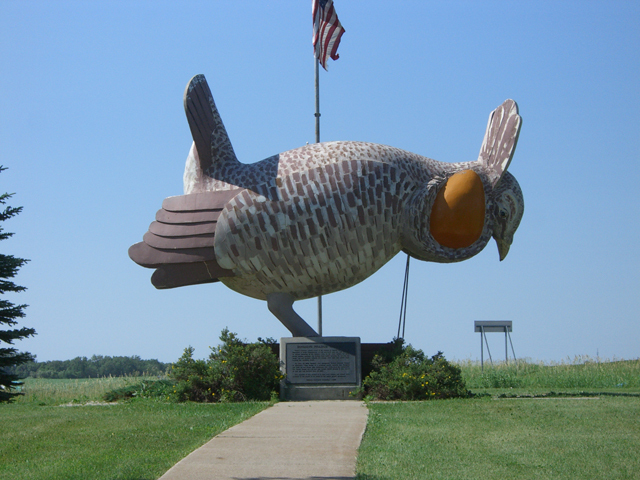 Upon entering Rothsay (population 500), which is located in gently rolling prairie just east of the pool-table-flat Red River Valley, one is greeted by this giant prairie chicken statue. Oh boy, by giant, I mean I could stand under the beak! The Rothsaians claim only that it's the "Prairie Chicken Capital of Minnesota." One wonders if it's because there are other prairie chicken capitals in, say, the two Dakotas or up in Manitoba or Saskatchewan that may have even grander prairie chicken statues which keep Rothsay from claiming it's the "Prairie Chicken Capital of the World." Or perhaps it's just typical Minnesota modesty. And to think this has been a family secret for 127 years! I've just updated my essay on Johan Bojer (linked permanently on the left) based on links kindly provided to me by Karen Husdal Brevik of Orkanger of his 1872 christening (Orkdal parish) and 1887 confirmation records (Stadsbygd parish). The specific page links seem to change over time, so I'm linking to the main group of kirkebok pages in each parish. Note that you can switch languages among Bokmål, Nynorsk and English. Bojer was a rissværing (person from Rissa) who wrote many successful novels published in both Norwegian and English. A good library will have several of them. His book, The Emigrants (Vor engen stamme in Norwegian), about emigrants from Stadsbygd parish to eastern North Dakota, is still available from AbeBooks, Alibris, Amazon, Barnes & Noble and Powell's. The first two are used book dealers and have several other titles of his as well. Be sure to look for The Last of the Vikings (Den siste viking), his most famous work, about rissværing fishermen in the Lofoten islands. Both church documents mentioned above showed that his father (from Oslo and not married to Bojer's mother) was named as Hans Böier in the christening record and Hans Boier in the confirmation record. Boier/Bojer is a Danish name which his father did not use in census and other records in which he is found, so I had erroneously thought that Bojer adopted it as a pseudonym after a trip to Denmark that he took his first book (for which he used the name Hansson) was published.